Valentina in East Putney is the second Valentina restaurant to open in the area, offering rustic Italian cuisine to eat in or to enjoy at home as well as an extensive wine cellar. The menu changes regularly in order to take advantage of fresh seasonal produce. What did you think of Valentina? If everybody that goes there asks them to keep something in their fridge there wouldn't be any space for their food and to be fair you should have planned it better, 3 days??? Went there couple of times already and food and service were really good. Definitely recommend. Good service and nice atmosphere. However, I cannot be so positive about the food. I ordered spinach and ricotta raviolis (which cost about £10) and was given a very big plate with a small quantity of raviolis inside. There were about ten of them in the plate - one pound per ravioli?? My boyfriend's pasta was too soft, and the taste average. All in all, you can get better value for your money elsewhere. Had a wedding reception there and they couldn't be bothered to wait for 3 days for the bride to pick up her cake so threw away the whole wedding cake or so they say!. No apologies and no compensation for a cake that cost hundreds of pounds, they could only offer another meal at one of their restaurants, how tight fisted is that. I would never recommend Valentina Mezzanine Restaurant to anyone, they even accused us of theft to cover themselves. How appalling! We wont ever forget this! Excellent food, friendly service and very nice décor. We were there with my fiancée a while ago so don't really remember what we ate but I think I had Capella Roman which was excellent. I walk past Valentina everyday to go to work and everyday i keep saying i must book for an evening meal. 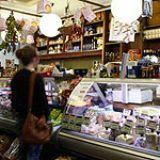 It has only been open about two months but it is always buzzing with people and the deli always looks busy as well. Finally I ate at Valentina on Friday evening and i must say after much anticipated excitement it exceeded even what i thought. The menu was different to what i expected, and was not mainstream at all. Very authentic home-style food, really tasty and the price matched. I had the Capella Romano which the waiter explained was a traditional Roman lasange! Tagliatelle pasta and grandma's meatballs wrapped in speck ham, baked and served with a tasty bolognese sauce! My friend had the Chicken breast with melted taleggio and potato fondant which gave me food envy, so i will be having that next time! The warm poached pear in red wine and balsamic finished it of perfectly. The wine list had 165 wines to choose from! Then to my amazement i realised were being sold at retail prices with £3.95 corkage fee if you dine in! This is a fantastic idea and more places should do it. I had a really decent wine for half what id pay for it anywhere else...so i bought a second bottle from the shop for home! To top it off, its stunning and the service is discreet, informative and really friendly..thank you everyone, we shall be back! Along with a ground floor deli and cafe, Valentina Mezzanine Restaurant serves up classic Italian food at good prices. Valentina is a big upstairs/downstairs space that’s been split into deli, cafe and restaurant. Upstairs, the mezzanine restaurant is fashioned with large floor to ceiling windows, wooden floors, low lighting and walls lined with comfy leather seating. 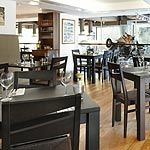 Whilst the look of the restaurant is modern and sleek, it manages to retain a family element to it, with old black and white family photographs adorning the walls. There’s a real buzz here, where the sound of soft Italian music is easily overshadowed by the lively purr of diners. The clientele is a mix of couples and professionals and the staff are incredibly friendly and very professional. Good, hearty Italian food is the order of the day at Valentina, where there’s a real home is where the heart is approach to the menu. Pasta dishes are of course on offer while there’s a good selection of meat dishes too. This is real Italian food. For starters (between £4 and £7.50), the antipasto classic platter offers a selection of cured meats from the deli downstairs. Flavoursome chorizo, prosciutto and several different salamis are complemented with a thick, homemade red pepper salsa that’s pleasantly mild. This one is great for meat lovers. The insalata caprese - buffalo mozzarella, tomatoes and basil - is gorgeously fresh. Presented on a wooden board and drizzled with extra virgin olive oil, the flavours are delicate, the cheese is light and creamy and the dish comes together perfectly. Mains include grilled lamb cutlets, baked sea bass and grilled chicken salad. The pollo funghi e taleggio is a mountain of a dish that’ll certainly fill you up. A whole chicken breast sitting on a large potato and covered in a rich mushroom, cheese and white wine sauce, the flavours are delicious despite the chicken being slightly dry. The rib eye is very crispy on the outside and tender on the inside, but the meat has a bitterness to it due to the char grilling which some may find unpleasant. It’s covered with a rocket salad and some very strong Parmesan shavings that are somewhat overpowering. Pasta dishes include homemade spinach and ricotta ravioli, tagliatelle al limone and very tempting meatballs wrapped in speck ham with bolognaise. Mains are priced between £8 and £15. If you can squeeze in dessert (£4 to £7), the warm pear cake is a great choice. It’s rich in fruity flavour and the texture is mousse-like and fluffy. For something lighter, try the ice cream. Served in its original Marine Ices tub with a thick piece of wafer, the chocolate flavour is dense and delicious. Wine, wine and more wine. There are so many options you could spend all night poring over Valentina’s wine list. The menu is divided into Italy’s wine regions, so you can take your pick from Tuscany’s finest reds, a dozen or so drops from the Veneto region or a selection of Sicilian grapes. And there’s something to suit every budget with wines from £12 a bottle and up. Valentina Mezzanine Restaurant is a top place to dine out in. The quality of the food is amazing, the vibe is energetic and the prices are just right. If you like Italian food, you’ll love Valentina.